In the wilderness He fed you manna which your fathers did not know, that He might humble you and that He might test you, to do good for you in the end. Otherwise, you may say in your heart, “My power and the strength of my hand made me this wealth.” But you shall remember the Lord your God, for it is He who is giving you power to make wealth, that He may confirm the covenant which He swore to your fathers. What does this passage say to me? First, God is our provider. Second, whenever we take credit ourselves for building up wealth, we are forgetting who gave us the abilities we possess. Third, God is not opposed to wealth creation, to working hard to provide for ourselves and our families; He just wants us to do so with the right attitude of gratitude for His blessings. This is a good starting place. No matter how wealthy one becomes, it means nothing in the Lord’s eyes if that person does not acknowledge Him. No matter how diligent a worker one may be, again it means nothing if it isn’t intertwined with an appreciation of the gifts and abilities provided by Him. This particular day, Labor Day, is supposed to honor the average worker. A couple things need to be understood first. There should be no dichotomy created between those who labor as entrepreneurs and executives, on the one hand, and those who perform what are called blue-collar jobs. Everyone works. There is no particular dignity attached to either management or “labor.” Anyone who carries out his job with gratitude, and who sees it as a calling from God, is honored by Him. There is no reason to assign greater honor to those in blue-collar positions. Yet Labor Day seeks to do that. Why? Well, this won’t go over well with some, but I’ll venture here anyway. 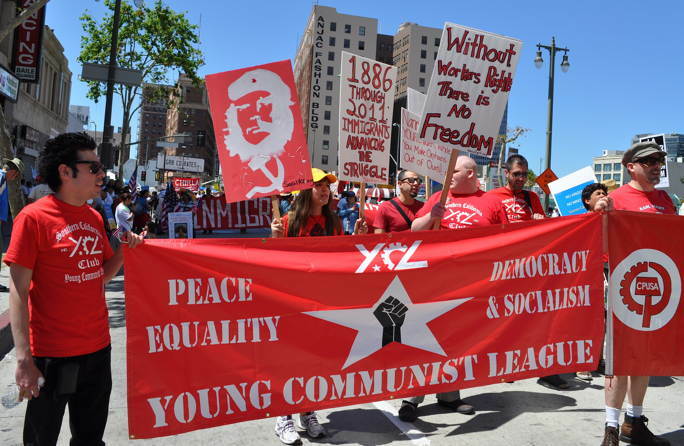 The roots of the holiday stem from a socialist agenda that pits management against workers. 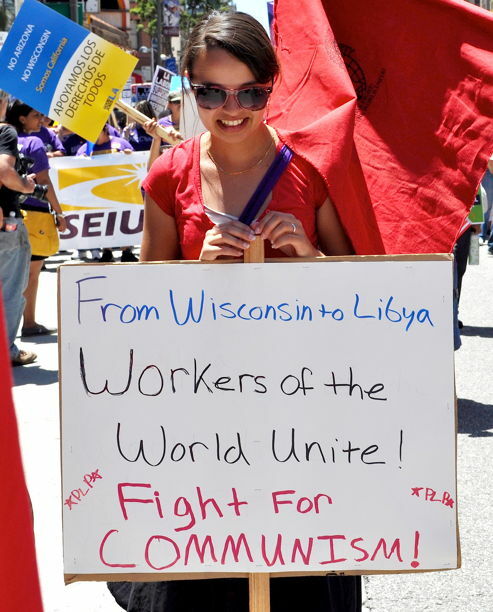 Throughout labor history, socialism and communism have played a significant role. And the reason they were able to make inroads into the movement is that some in management made such poor decisions that they, in effect, pushed people toward the socialist solution. This history of labor unions is spotty at best. We could start with the Haymarket riots that erupted in Chicago in 1886. A strike led to violence in which policemen were killed. Then there was the Homestead Strike in 1892 against one of Andrew Carnegie’s steel plants. It turned into a pitched battle where strikebreakers were attacked and killed. Two years later, the Pullman Strike against the railroads also got out of control. 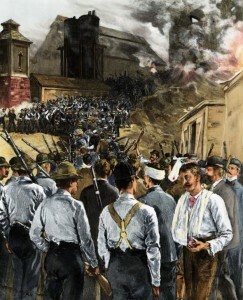 The workers at the Pullman factory had legitimate grievances, but when federal troops arrived to protect the running of the trains for mail service, again riots ensued. Railcars were tipped over; buildings were set on fire; people were killed in the melee. It took great force to stem the violent tide. During the Great Depression, FDR courted union favor and put the government on their side. FDR’s New Deal was very anti-business, and government encroached on areas where it had never been before. Result? The Great Depression never really went away until after WWII. Some analysts say that real prosperity didn’t return until the 1950s. Yet the unions had it good. Their power grew exponentially. Union leadership became part of the privileged class, not much different than highly paid executives. Union membership has decreased dramatically in the past few decades. Union leaders fear their loss of power. The Obama administration has given them new life. Organizations such as the SEIU have figured prominently in administration circles. 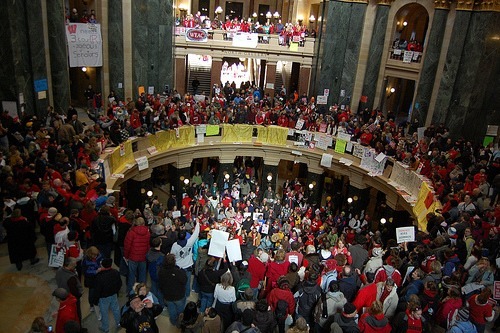 The latest battleground was Wisconsin where a new Republican governor and Republican-controlled legislature, facing imminent financial disaster, largely due to state expenses for union benefits, passed a law that cut back on union power in negotiating. Remember the scene? Protesters taking over the Capitol? Thugs menacing the families of legislators? Democrat politicians fleeing the state to try to stop the new law from being passed? The trashing of the Capitol building itself, which cost quite a bit to repair? They lost anyway. Hopefully, this is an indication that their day has gone. By the way, that hated law has resulted in jobs being saved. Have you heard much about that from the mainstream media? I thought not. 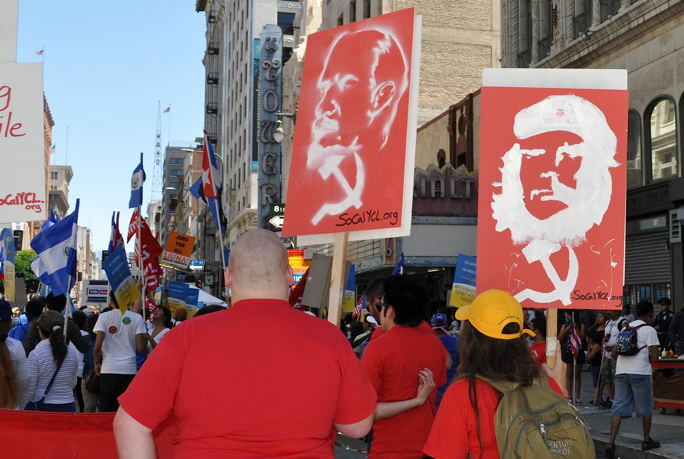 Posters honoring Vladimir Lenin and Che Guevara don’t inspire me. On this Labor Day, let’s honor genuine, honest labor, whether it is classified as blue-collar, white-collar, or any other type of collar you prefer. Let’s remember that it is God who gives us the ability to make wealth, and let’s labor with gratitude for His provision. Above all, let’s do all that we do for His glory.